Northeast Scout Ian Cundall was one of many members of our SoxProspects team reporting from Fort Myers. Cundall took in the Low A Greenville game last Saturday. He said that Jose Vinicio impacted the game at the plate, on the bases, and in the field. He reached base four times in the game, three times because his speed caused defenders to rush their throws, and looked comfortable in the field, showing good range and easy, fluid mechanics on defense. Cundall also noted that 2011 first-round pick Blake Swihart showed off a strong arm behind the plate. Jordan Weems was swinging late on fastballs in his first two at bats, but made an adjustment in his third, shortening his swing and lining a fastball to left for a single. Keury de la Cruz had three plate appearances where he hit the ball the other way, including one solidly driven double. The other two appearances were a groundout to the third baseman and a flyout to left. Cundall notes that de la Cruz has filled out physically since last season, which should help him square up fastballs and drive them with authority. Meanwhile, SoxProspects.com’s Director of Scouting Chris Mellen reports from Fort Myers that Pete Hissey is the most improved hitter in camp. Editor-in-Chief Mike Andrews had Mario Alcantara sitting 92-94 in a simulated game, Madison Younginer hitting 93-94, and Frank Montas impressively touching 98 while also showing a slider at 83 and change in the high 80’s. Andrews thinks both off-speed offerings can be major-league-quality pitches. Andrews also reports that it appears Triple-A Rule 5 draftee Gerardo Olivares is being converted to a pitcher after being a catcher for his entire professional career. The week’s biggest news was that the Red Sox ended the spring-long media debate and optioned Jose Iglesias to Triple-A Pawtucket, as Brian MacPherson of the Providence Journal reports. However, the time in the minors is only temporary, says ESPN Boston’s Gordon Edes. MacPherson talks to Red Sox hitting coach Dave Magadan, who weighs in on Iglesias’s approach at the plate this spring. Magadan said Iglesias showed positive strides at the plate, but was unable to maintain the improvements after experiencing not having success for a couple games. Lars Anderson, who was experiencing a spring renaissance, was also optioned to Triple-A. He is expected to continue to see time in left field after getting his first game action out there this spring according to MacPherson. Vicente Padilla signed with the Red Sox because he wanted a chance to win a rotation spot, per WEEI.com’s Rob Bradford. However, Bradford adds that Padilla would rather pitch out of the Sox bullpen than find another team. Chris Carpenter, received as part of the Theo Epstein compensation deal, needs elbow surgery to remove bone spurs and will be out indefinitely. The Sox sent Jair Bogaerts, twin brother of Xander, to Chicago this week to complete the compensation for Epstein. The Boston Globe’s Peter Abraham thinks he has figured out the Red Sox rotation and it includes Daniel Bard and Felix Doubront. Gordon Edes makes a case for that arrangement, but Alfredo Aceves is finishing strong and nothing is set in stone yet. Bobby Valentine is impressed with Doubront’s progress, as ESPNBoston’s Matt Porter writes after a strong six inning performance Saturday against Miami. NESN.com’s Didier Morales believes that Doubront’s time to shine may have come. MacPherson is impressed with Ryan Lavarnway and he’s not the only one. NESN’s “Road to Fenway” series posted this video on outfielder Bryce Brentz. WEEI.com’s Alex Speier sat down for an excellent interview with Ryan Westmoreland in this short podcast. ESPNBoston’s Gordon Edes wonders if Pedro Ciriaco could crack the big league roster, NECN’s Maureen Mullen also makes the case for the last bench spot. FanGraphs’s David Laurila hits Henry Owens with ten questions. SoxProspects Digital Correspondent Jonathan Singer reports that the Red Sox have signed three free agents from Venezuela: left-handed pitchers Carlos Garcia and Jervis Torrealba and catcher Kevin Segovia. Rosters will be shaping up over the next few days, so make sure to check in to SoxProspects.com and to follow us on Twitter @SoxProspects to get up-to-the minute news. Dan Hanson & James Dunne are Staff Writers for SoxProspects.com. Follow James on Twitter @JamesMDunne. Strengths: A natural shortstop, Iglesias makes things in the field look easy. His defensive package is highlighted by his extremely quick hands, graceful footwork, and outstanding instincts. Iglesias smoothly uses his hands to pick grounders with his glove or adjust quickly to bouncers with tough hops. He transfers the ball with lightening speed from his glove to throwing hand. His anticipation and vision of the ball allows him to react instantly at the crack of the bat. Iglesias moves fluidly to both his left and right, with his range grading as well above-average. There are not many balls hit out his way that he cannot reach. With excellent balance and strong agility, he keeps his body under control when making plays on the run or off-balance throws with his plus, accurate arm. Iglesias is presently major league ready defensively and projects as an elite defender at the shortstop position. Offensively, he utilizes a compact, low maintenance swing. He generates plus batspeed by firing his wrists to drive the head of the bat to the point of contact. Iglesias hits fastballs well, especially on the inner third. He pulls his hands in quickly to clear out heaters in this area and hits the ball the hardest when pulling line drives from the left-center field gap to the left field corner. Iglesias has the hit tool to produce batting averages in the .280s at the big league level in his peak seasons. He projects as a major league regular on a first division team, who hits ninth in the lineup. Development Needs: Iglesias’ approach and pitch recognition need considerable improvement if he is to develop into more than a below-average hitter at the major league level. While he made strides with his pitch selection and shrinking down his strike zone last season, he tends to consistently look for fastballs on the inner third. This leaves him vulnerable to offerings away, especially breaking balls. Iglesias is often frozen by curveballs or sliders on the outer third because his eyes are not covering the plate. His hips open early, which causes him to pull off the ball when he tries to attack them. Iglesias gets into patterns of guessing in counts due to his lack of trust in picking up the spin of the ball and over-commits his weight onto his front foot. This leaves his hands too far forward during his swing. Iglesias controls the bat well, but is reduced to lunging or reaching for secondary offerings to put them weakly into play. He must learn to stay back on the ball in order to barrel these pitches up more consistently. With home run power that projects in the low single digits, Iglesias needs to focus more on using the whole field to produce consistent line drives as well. He is capable of driving balls to right field and has improved using his hands to hit to the opposite field, but does not look to do so often enough. Iglesias is likely to be inconsistent offensively at the major league level in his early career, hitting in the .230s-.240s with little extra base power. 2012 Outlook: After competing for the starting shortstop position with the big club in spring training, Iglesias was recently optioned to Triple-A. This will provide him a chance to continue to work on his offense and build his level of experience. Iglesias does not have to contribute strong offensive production due to his defense, but must show he is beginning to come up to speed against the advanced pitching of the International League and is less over-matched than last season. It would be ideal for him to ramp up into facing major league pitching this season. Iglesias will likely be asked to move runners along, drop down bunts, and most importantly have meaningful plate appearances when called back up. His work during his time with Pawtucket is important to make as smooth a transition as possible. I see Iglesias spending two to three months in Triple-A before he begins to push the issue of getting a shot as the starter with the big club. The defensive value is going to be hard to keep off the roster, even if the offense is still lagging behind. In a perfect world, there are no bumps in the road, but expect Iglesias to be a hitter that takes time to learn at the big league level. His contributions this season will rest with shoring up the left-side of the infield’s defense and beginning to put a firm hold on the starting job for seasons to come. Strengths: Well-filled out and strong, Lavarnway is an imposing hitter in the batter’s box. He patiently grinds through plate appearances to pick out pitches he can drive. Lavarnway is comfortable taking strikes or letting pitches pass that he is not looking for in hitter’s counts. He will take walks and also force pitchers to pile up pitches against him. Although possessing a long swing and lacking elite batspeed, he is quick with his trigger and explodes quickly with his hands when getting started. He creates strong leverage to bring the bat on an upward path through the hitting zone to produce flyballs with carry. Lavarnway is adept at hitting mistakes, especially out and over the plate where he can extend his powerful arms. He makes opposing pitches consistently pay for missing their spots. His power projects as solid-average-to-better at the major league level. Lavarnway will also cut his swing down when behind in the count and look to work to the opposite field when necessary. He shows his best power from center to left field, but can drive offerings on a line to right field. He is capable of maintaining a batting average in the .270s during his peak seasons. Lavarnway is a tireless worker and has put a lot of time into improving his defense behind the plate. Extremely rough two seasons ago, he has become more fluid and firm behind the dish when receiving pitches. He moves easier from side-to-side and has become less tangled when throwing as well. Lavarnway has the type of makeup to fully maximize his skills. He projects as a part-time catcher and designated hitter at the major league level, who hits fifth or sixth in a lineup. Development Needs: Lavarnway’s defense is still on the limited side. He has made considerable improvement, but can still be rigid and stiff behind the plate. He struggles with breaking balls in the dirt, often boxing them around rather than controlling them. Lacking quick feet, he at times looks stuck in the mud and can go through stretches of fighting things behind the dish. Lavarnway can be slow coming out of his crouch when throwing, which slows him down and takes away from his solid-average arm. He also needs work with the positioning of his glove to set up correctly so pitchers have a target for throwing strikes. Lavarnway’s hand tends to drift off the plate or he stabs at offerings, giving the home plate umpire less of a look at pitches. His defense may never progress beyond fringe-average-to-average, but his offense can carry the glove. However, Lavarnway has some holes in his swing that can be exposed by big league pitching and there are adjustments at the plate to be made. Given the nature of his swing, he presently has a tough time getting good wood on offerings running in on him. Since he likes to get big extension to drive pitches, harder two-seam fastballs from right-handed pitchers tie him up. He can also be beat with elevated fastballs above the belt on the inner third or up-and-away. Lavarnway is likely to strike out over 100 times a year as a hitter for power, but needs to work to expand the spots he does his damage against to be more than a mistake hitter against mediocre major league pitching. Improvement pulling his hands inside the ball when facing harder throwing pitchers is an important adjustment that will allow him to make consistent contact. 2012 Outlook: Lavarnway has done everything asked from him during spring training, but is ticketed for Triple-A to continue to work on pushing his defense to be adequate at the major league level. Being able to catch everyday with Pawtucket is necessary to give him every chance to maximize his defensive development. I see little offensive resistance for Lavarnway as his bat is at the stage where the next test lies with facing major league pitching on a consistent basis. His time in Triple-A will keep him sharp and also allow him to ramp up before a potential major league call. Lavarnway is first in line should there be an injury to the catching corps or a need arises with the designated hitter position during the season. It is tough to foresee how the composition of the roster will shakeout over the course of the season, but at some point it is highly likely Lavarnway finds himself with the big club. The biggest focus is on the progression of his defense in 2012. There may come a point when his bat will be too hard to keep off the roster and his defense simply is what it is. Lavarnway is seemingly pushing hard for a shot in 2012 and could end up seeing himself in the mix during the stretch run of the season. Brian McPherson of the Providence Journal reports that the Red Sox have sent first baseman Jair Bogaerts to the Chicago Cubs, completing the compensation for general manager Theo Epstein. The Red Sox had previously received right-handed pitchers Chris Carpenter and Aaron Kurcz from Chicago. 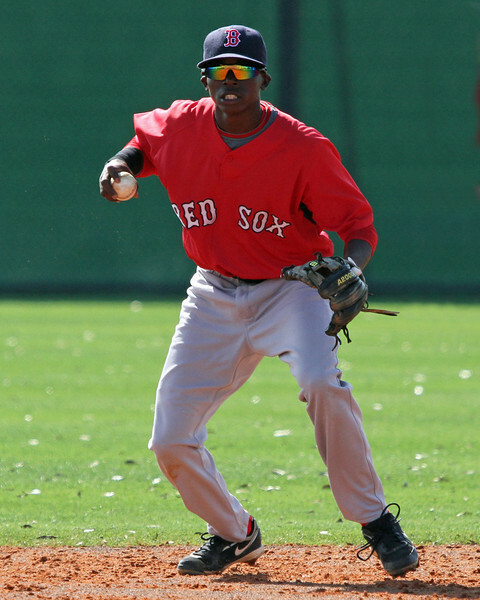 Bogaerts, 19, was originally signed by former Sox scout Mike Lord in August 2009. He played the past two season in the Dominican Summer League. After a difficult debut season, Bogaerts rebounded in 2011 to hit .288/.387/.404 in 47 games. 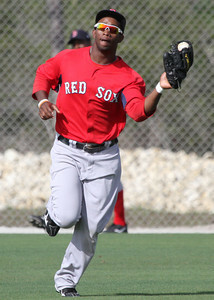 He is the twin brother of highly-touted shortstop prospect Xander Bogaerts. According to Baseball America, the Red Sox have released catcher Max St. Pierre. St. Pierre was a non-roster invitee to major league camp earlier in spring training. The 32-year-old St. Pierre originally signed a minor league contract with Boston back in January after spending 15 seasons as a member of the Detroit Tigers organization. He has spent the vast majority of his career in the minor leagues, getting called up to the majors for the first time in 2010, collecting 2 hits in 9 at-bats. FORT MYERS, Fla. – Williams Jerez has made a lot of adjustments on the fly in his life, most of which make the ones that loom in his path to the big leagues seem small by comparison. At 17, the five-year process of emigrating from the Dominican Republic to New York culminated with Jerez, his father and sister leaving his mother behind and starting anew in New York. They knew no one, and Jerez spoke no English. He learned a bit in school, though he struggled to read in a foreign language. But like so many ballplayers before him, baseball was the constant in a world he barely recognized. His skills were quickly noticed, and before long, professional scouts came calling. A Yankees scout was first on the scene, but Red Sox northeast scout Ray Fagnant wasn’t far behind. The outfielder first met Fagnant at a Perfect Game tournament in 2010. “When he saw me for the first time in a game, I hit 3 for 4 and he said, ‘you’re looking good,'” Jerez said after wrapping up a day’s work in Fort Myers last week. “He started to talk to me and he said, ‘I’m going to every game, wherever you are.’ ” Fagnant would soon be joined by many more scouts, but Boston was the team that tapped Jerez in the second round of the 2011 MLB Draft and ultimately signed a player with limitless potential. Now that player is in Fort Myers, where he will likely remain after spring training, with an eye towards coming north to Lowell in June. And though baseball seems to come as easily to Jerez as the smile he wears around the fields behind JetBlue Park, it’s all that surrounds the game that now requires adjustments for the Dominican outfielder. “My first season was difficult for me because when I came here, I didn’t know much about the process, how they work,” he said. Though baseball, as he said, is the same baseball, the routine in Fort Myers was yet another adjustment for him to master. In the Dominican Republic, he played baseball all morning and worked on his studies in the afternoon. In high school, he had to balance both, all while fighting allegations that he was misrepresenting his age. When it came time to actually become a professional, Jerez learned what those words truly meant. He signed for $443,700 on July 12 and made his debut in the Gulf Coast League four days later. He collected hits in 11 of 12 games during one early-season stretch and had his batting average as high as .340, but eventually he tapered off. He finished the season batting .248 with just six walks in 32 games. “He came in right away and actually played a lot better than we thought he would, but it caught up with him,” U.L. Washington, hitting coach for the Gulf Coast League Red Sox, said. Like many talented but raw draftees, Jerez used his skills alone to overpower high-school competition, but the jump to professional baseball is steep, and the 19-year-old had more waiting for him than just games. He’s learned from more than just the computer, of course. He says he’s constantly learning from teammates and coaches, and has modest hopes for this season. He hopes to be relaxed and focused this season at the plate, to wait for his pitch and not try to do too much to it, a far cry from the player who swung at everything last summer. Overall, Washington said Jerez has looked “outstanding” this spring. Jon Meoli is a Senior Columnist for SoxProspects.com. Follow him on Twitter @JonMeoli. In the outfield, the Red Sox have a handful of prospects that could develop into impact major leaguers, although none are sure bets at this stage. The club also has some solid depth at the upper levels of the system, whether in the form of major-league veterans who will serve as big-league insurance or minor-league veterans who project as contributing major-league role players. There’s some room for upward advancement to the big club as well, as only Carl Crawford is signed to a long-term deal; Jacoby Ellsbury and Ryan Sweeney are under club control through 2013, and Cody Ross will be a free agent next offseason. With that, here’s a look at the top outfield prospects in the Red Sox minor league system. Chris Carpenter tweeted that he will have surgery on Thursday, March 29 to remove a bone spur in his elbow. The surgery will be performed by renowned orthopedic surgeon Dr. James Andrews. It is unknown how long Carpenter will be out. The Red Sox received Carpenter, a right-handed pitcher, in the offseason as part of the compensation for former General Manager Theo Epstein's departure. Per NESN's Didier Morais, Carpenter will not throw for 6-8 weeks. According to SoxProspects Digital Correspondent Jonathan Singer on Twitter, the Red Sox have released right-handed pitchers Swen Huijer and Renny Parthemore. Huijer, 21, was signed as an international free agent in the spring of 2008. After spending his first three professional seasons as a member of the Rookie-Gulf Coast League Red Sox, Huijer compiled a 2.43 ERA in 14 relief appearances as a member of the Short-Season A Lowell Spinners last season. Parthemore, 20, was originally drafted by Boston in 18th round of the 2009 amateur draft out of Cedar Cliff High School in Pennsylvania. His professional career has been derailed by injuries, causing him to miss the entire 2010 season. He made his professional debut as a member of the Gulf Coast League Red Sox in 2011, compiling a 3.30 ERA in 14 relief appearances. 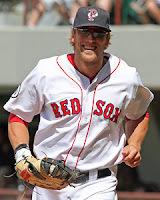 The SoxProspects community has voted for its 2012 pre-season All-Stars at each position. These are the players that are expected to have the best season in the Red Sox minor league system at their respective positions, and ideally does not take prospect status into consideration. Lavarnway is coming off a fantastic 2011 season in which he won his second consecutive Red Sox Minor League Offensive Player of the Year award. Lavarnway began the season in Double-A Portland, hitting .284/.360/.510 with 14 home runs in 55 games before his promotion to Triple-A Pawtucket. He was even more impressive in his 61 games with the PawSox, compiling a .295/.390/.612 line and adding 18 home runs. Lavarnway made his major league debut on August 18, and appeared in 17 games, with his most memorable performance a 2-home run, 4-RBI game in an 8-7 win against Baltimore in the penultimate game of the season. Continued concerns about his defense mean Lavarnway will begin the season back at Pawtucket to work on that side of his game, but expect the Yale alumnus to get the chance to contribute at the major league level at some point in 2012. Entering his sixth season in the Red Sox organization and now three full years removed from his position atop the 2009 prospect lists, it is easy to forget that Anderson is still only 24 years old. He is coming off a 2011 season that saw unspectacular but steady production in the shadow of two potentially major distractions: being blocked by the acquisition of Adrian Gonzalez, and a deadline deal that would have sent Anderson to the Oakland Athletics but was aborted when pitcher Rich Harden's medicals came into question. Through the tumult, he hit .265/.369/.422 and led the International League with 80 walks. Anderson will return to Triple-A as insurance in case of a Gonzalez injury and potential trade bait. Coyle, a third round draft pick in 2010, is coming off an impressive first full season in the Red Sox organization. In 106 games at Low A Greenville, Coyle had well-rounded production, using a compact swing and patient approach in compiling 27 doubles, 7 triples, 14 home runs, 20 stolen bases and 60 walks. However, 110 strikeouts led to a mediocre .247 batting average. Coyle’s top developmental goals in 2012 will be to work to improve his pitch selection within the strike zone and using the opposite field more effectively while continuing to pull the ball with authority. 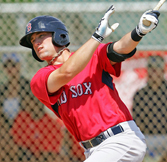 Though Cecchini’s 2011 season ended with a fractured wrist after only 32 games at Lowell, his excellent production during that time gave a glimpse of why the Red Sox organization is excited about this 2010 fourth round pick. His .298/.398/.500 slash line included 12 doubles, 17 walks, and 12 stolen bases in only 117 at-bats. Reportedly completely healed, Cecchini is a candidate to have a breakout season. Expect him to be assigned to Low A Greenville to begin the 2012 season. As an 18-year-old, Bogaerts made a huge leap forward in 2011, and was named the SoxProspects.com Breakout Player of the Year. A home run rate of 1 every 16.5 at bats highlighted an overall .260/.324/.509 slash line and is leading to Bogaerts receiving national attention as a prospect. Going into 2012, his biggest questions involve his high strikeout rate and whether he will grow out of the shortstop position and need to move to a corner infield or outfield spot. While these concerns are important, if Bogaerts’ power and hitting continues to develop it will play at any position. 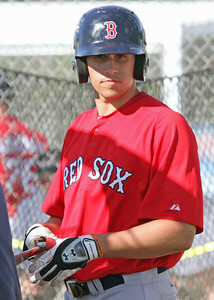 Brentz, the second of three Red Sox first round picks in the 2010 draft, initially struggled with the transition to wooden bats in 2010. However, in 2011 he put fears that his college power was an aluminum-generated mirage to rest. Beginning the year at Greenville, Brentz had a phenomenal .359/.414/.647 slash line with 11 home runs in 40 games before being promoted to High A Salem. Against the tougher competition of the Carolina League, Brentz battled to a .274/.336/.531 with 19 home runs in 288 at bats. Overall, his 91 runs scored and 94 RBI led Red Sox minor leaguers, while his .574 slugging percentage and 30 home runs placed him second. Brentz will likely begin 2012 at Double-A Portland. Jacobs made a huge step in 2011 in his transition from raw athlete to polished baseball player. The 2009 tenth-rounder, who was given a $750,000 bonus to forgo a football scholarship at Auburn, turned heads at Low A Greenville. Jacobs’ combination of power and speed was impressive, compiling 32 doubles, 17 home runs and 30 stolen bases. However, it was his .376 on-base percentage, placing him ninth in the South Atlantic League, that shows how far Jacobs has come with polishing his baseball skills and improving his approach at the plate. A supplemental first rounder in the 2011 draft, Bradley is looking forward to his first full season in the Red Sox organization. Expected to be a high first rounder after an excellent sophomore season at South Carolina, his stock fell some when he struggled to a slow start his junior year and later injured his wrist, limiting him to only 37 games. Fully healed, Bradley appeared in 10 games after signing at the end of the 2011 season. Bradley has a high upside as a hitter, and has earned a reputation as a sterling defensive outfielder. Scouts see him as a true center fielder in the long term, with solid speed and excellent instincts. 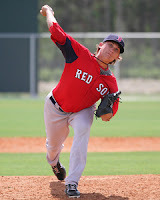 Drafted by the Red Sox in the first round of the 2011 Draft, Barnes is likely to start his 2012 campaign with the Greenville Drive with a possible call-up to Salem depending on his success. Barnes posted impressive numbers in his sophomore and junior years at the University of Connecticut. In his sophomore season, he went 8-3, posting a 3.92 ERA, and striking out 75 batters over 82.7 innings. He walked only 25 batters for a 1.26 WHIP. In his junior season, he threw significantly more innings (116.7), but had even more success. He went 11-4, posting a 1.62 ERA. He struck out 111 batters and walked only 31, and also allowed only 71 hits for a 0.87 WHIP. Dealing with the workload of a professional season may cause some road bumps, but he is relatively polished for a first year pitcher and is expected to transition smoothly. In his first full professional season, Ranaudo split time between the Greenville Drive and the High A Salem Red Sox, but spent the majority of his season with the latter. He dominated in Greenville, where he went 4-1 with a 3.33 ERA. He struck out 50 batters and walked only 16 for a 1.11 WHIP. He didn’t dominate as much in Salem, posting a 4.33 ERA over 81 innings. He struck out 67 batters and walked 30. 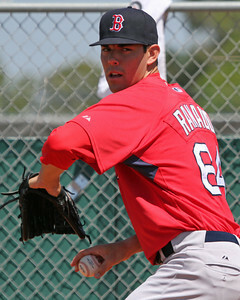 Ranaudo is nearly unanimously considered the top pitching prospect in the organization, and is likely to start 2012 with Double-A Portland. Alex Wilson has come a long way since being drafted by the Red Sox in the second round of the 2009 draft. He excelled at the lower levels of the minors—skipping Greenville and making it to Double-A in only his first full season, but struggled in his initial call-up to Portland, posting a 6.66 ERA over 78.3 innings. Wilson quelled whatever doubts there might have been with an extremely solid 2011 campaign with Portland that warranted a late call-up to Pawtucket. With Portland in 2011, Wilson went 9-4 with a 3.05 ERA, striking out 99 batters over 112 innings. In 21 innings for Triple-A Pawtucket, he posted a 3.43 ERA, struck out 24 and walked only 7. 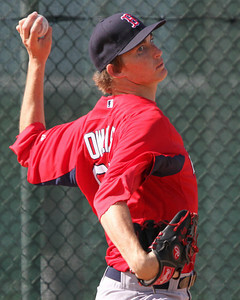 Wilson is likely to start the 2012 season with Pawtucket, where he will be a fixture of their rotation. Henry Owens is a tall, left-handed pitcher who was drafted by the Red Sox in the supplemental first round of the 2011 draft. After dominating in his senior year of high school—he went 11-0 with a 1.10 ERA, striking out 114 over 77 innings and walking only 25—he decided to sign with the Red Sox instead of playing Division-1 baseball at the University of Miami. Owens’ arsenal includes a fastball, a slider, and a circle changeup. He is working on improving his arm strength and adding velocity to his fastball. 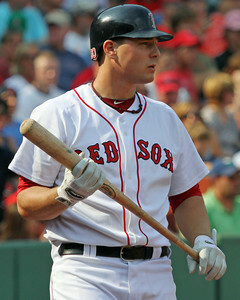 He is likely to start the 2012 season with the Greenville Drive. After missing the entire 2010 season due to Tommy John surgery, Tazawa threw only 59.6 innings in 2011, where he spent the majority of his time between Salem, Portland, and Pawtucket, and also threw 3.0 innings for Boston. The Red Sox initially signed Tazawa as a starter, after he went 13-1 with a 1.80 ERA, striking out 114 over 113 innings in 2008 with the Nippon Oil. Tazawa had an impressive 2009 campaign, splitting time between Portland and Pawtucket, but didn’t see as much success in his 25.3 innings with the big-league club. Tazawa began his 2011 rehab with Salem, where he posted a 6.05 ERA over 19.3 innings, but saw his statistics improve when he moved on to Portland (4.70 ERA over 23 innings, 1.17 WHIP), and again in Pawtucket (2.51 ERA over 14.3 innings, 1.19 WHIP). 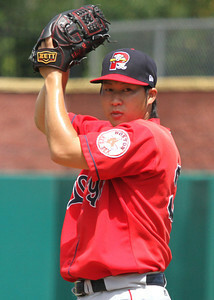 Tazawa will likely continue his development out of the bullpen, and should start the 2012 season with Pawtucket. Tazawa will likely make appearances with the big-league club throughout the season, and has the potential to stick with the club midseason. The Red Sox signed Erasmus as an international free agent in March 2007. He had success with the Gulf Coast League in both 2009 and 2010. In 2009, he posted a 2.05 ERA and struck out 25 batters over 26.1 innings. In 2010, he had similar numbers, posting a 2.12 ERA over 29.2 innings, striking out 33 batters. Erasmus began the 2011 season in Extended Spring Training, but was called up to and stuck with Greenville for the rest of the 2011 season. He worked out of the bullpen, where he went 4-1, posting an impressive 1.11 ERA over 40.2 innings. He also struck out 36 batters and walked 11. 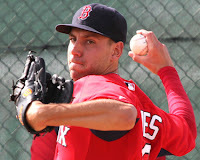 Erasmus is likely to begin the 2012 season working out of the Salem bullpen. Fields was acquired in the Erik Bedard trade that sent former Red Sox prospects Chih-Hsien Chiang to Seattle and Tim Federowicz, Stephen Fife, and Juan Rodriguez to the Dodgers. The Mariners drafted Fields in the first round of the 2008 draft. He spent his first two seasons in Double-A, showing improvement in his second season in which he posted a 3.14 ERA over 28.7 innings and a 1.29 WHIP. In 2011, he split time between Double-A and Triple-A before being traded to Boston. He posted a solid 2.77 ERA over 26 innings in Double-A before struggling in his 13 innings with Triple-A Tacoma where he posted a 6.23 ERA. After being traded to Boston, he spent the rest of 2011 with Double-A Portland, where he posted a respectable 3.12 ERA over 17.3 innings. He struck out 25 batters and allowed only 10 walks and 10 hits for a 1.15 WHIP. Fields is likely to begin 2012 in the Portland bullpen again. James Dunne is a Staff Writer & Elizabeth Dreeson is a Special Contributor for SoxProspects.com. Follow James on Twitter @JamesMDunne and Elizabeth @Eli_Dreesox. Strengths: Brentz incorporates his whole body into his swing, which enables him to create strong torque and leverage. His strong hands drive the head of the bat on an upward plane through the hitting zone with force. Brentz’s batspeed grades as plus. He extends well post-contact to drive offerings he squares up with lift and backspin. An excellent fastball hitter, Brentz is capable of turning around higher velocity ones on the inner third by pulling his hands in quickly to clean them out and extending on heaters middle-to-away to drive them hard to the opposite field. He has improved reducing the wrap in his swing that he showed after first signing with the organization. Brentz has the type of power to produce 20 or more home runs at the major league level and in his peak hit sixth in a first division team’s lineup. With an improving approach and showing more willingness to use the whole field last season, his hit tool can carry him to average-to-better batting averages with further honing of his selectiveness at the plate. Defensively, Brentz has improved his routes and judgment of flyballs in the outfield. He drifts less when tracking balls. His plus arm is a weapon against advancing baserunners and he does a good job getting his weight behind throws when charging balls. Brentz profiles as a right fielder, with the ceiling of an everyday player on a contending team. Development Needs: Brentz’s aggressive pitch selection is an area that needs improvement as he gets going in the upper minors. He tends to chase too many elevated fastballs and rarely cuts down his swing with two strikes. Brentz excels at hitting fastballs, but has to learn the strike zone better to hit consistently against upper level pitching. Over-expansion of the zone with his eyes leads to wild swings at balls out of the strike zone and the chasing of poor pitches in hitter’s counts. With fewer mistake pitches to hit, it is important for him to learn to be disciplined at the plate. Brentz does not project as a high walk player, but must show he is willing to take pitches out of his hitting zone so he does not get himself out on a consistent basis. He will also be challenged by advanced secondary offerings. More advanced pitchers will mix them in at any point in the count and Brentz’s recognition has to be quicker to prevent him from over-committing his weight. At times, he does not see breaking balls well and opens his hips up too early. This leads him to pulling his head off the ball to wrap the bat around sliders or weakly chop curveballs into play. Without improvement managing the strike zone against secondary offerings and refining his selection, it is tough to project Brentz as maintaining enough solid contact to profile as a regular at the major league level. 2012 Outlook: Brentz is set for an assignment in Double-A when the teams head north to start the season. The Eastern League is going to be a test of his strike zone management skills. A tough pitching league, Brentz is likely to be pushed early in the season to adjust and see much more polished secondary offerings than in the lower minors. I feel Brentz is a candidate to take a step back during the first half of the season as he is forced to adjust at the plate. While he can show power against mistake pitches, his evolution into a more polished overall hitter is the key to being successful and proving he can be disciplined enough to develop into a consistent major league hitter. This type of resistance is good for his development. Experience is necessary to drive the process of becoming more selective at the plate. The application of what he learns can lead to him showing more and more consistency as he gets deeper into play during the Double-A season. Brentz has the skills to be a productive big league hitter. 2012 is a year to work on the finer points of hitting and prove his projection is coming to fruition in the near future. Strengths: With an ideal power hitter’s frame, Jacobs’ body has been developing into that of a baseball player’s over the course of the last 18 months. He has dropped a lot of his football bulk in the shoulders and chest. Jacobs is very muscular, especially in the lower body, but the development of more lean muscle in his upper body has lead to less restriction with his actions. He unleashes a swing with strong leverage that has fluid hip rotation. Jacobs creates plus batspeed. He barrels up fastballs out and over the plate well, producing solid backspin and carry. When extending with his arms and driving with his lower body, he is capable of hitting the ball a long way. Jacobs has plus raw power and the type of power to produce 25 home runs in his peak. He covers the plate well with his swing to get the fat part of the bat on tough offerings. Even when not fully squaring an offering up, he has the strength to still hit the ball relatively hard or muscle hits into the outfield. Jacobs has taken well to developing patience at the plate and going deeper into counts during his early career. He has shown dedication to learning the strike zone and a strong desire to get better at his craft. Jacobs possesses a level demeanor in handling the ups and downs of a baseball season. A good athlete for his size, he moves well once he gets going and can range well both to his right or left in the outfield. Jacobs has the ceiling of a power hitting outfielder at the major league level on a contending team. Development Needs: Jacobs is rough defensively with his reads and routes in the outfield. He tends to freeze on contact and take angles that are too flat when tracking flyballs down. Balls hit over his head can be an adventure at times as well. Jacobs needs to become more comfortable judging balls hit out his way. His arm strength has been improving with the loss of extra bulk, but it fits best in left field. His defense projects to be average. Without much versatility, his future major league value is tied into his offensive production. This puts a strong emphasis on his development at the plate and polishing off his areas of need. Jacobs’ swing can get too long, which makes it tough for him to consistently clean out pitches on the inner third. Learning to pull his hands in against these offerings is a must to close this hole. Jacobs has shown to be improving in this area with experience though. He also produces too much yank and upper-cut to swing through pitches when over-aggressive against fastballs above the belt. He sits back better against secondary offerings than when he first signed, but is still fooled by sharp breaking balls and hits out on his front foot against them. Further progress picking the spin up out of opposing pitchers’ hands is necessary in higher levels or his hitting is at risk to plateau. Jacobs will be prone to striking out as a power hitter, but must learn to cut his swing down in certain counts to develop into more than a fringe-average hitter for batting average. 2012 Outlook: Jacobs was one of the most improved players in the system last season and made strides sharpening his initial rough edges during 2011. He will look to carry things forward in High A this season. This placement will continue to push Jacobs against secondary offerings and the more polished pitchers of the Carolina League will force him to stay back consistently to be successful. A good fastball hitter between the knees and tops of the thighs, he is likely to drive a lot of these offerings when being selective working counts. I do not see Jacobs being over-matched or exposed at this level, but he will have to make adjustments to consistently display hard contact. Becoming more proficient hitting breaking balls and capable of turning on inside fastballs to produce hard contact are keys in showing that he is trending towards becoming more of a complete hitter. By taking these steps, Jacobs should be trending towards being ready for Double-A and make the jump in 2013. FORT MYERS, Fla. – Derrik Gibson has a very specific, even archetypal set of skills for a middle infielder. He’s a smooth fielder with an accurate arm and professional experience at second and short. His speed allows him to turn singles into something more, either by stretching singles into doubles or slapping base hits and quickly swiping second. But as his batting average hovered around .200 in the middle of last season with High A Salem, Gibson realized that such players, even if other parts of their game lack, can succeed too. Then he started to himself. That realization, which began in Greenville in 2010 and cemented itself in the middle of last year’s Carolina League campaign, was something of a weight off Gibson’s shoulders. “You definitely become a better ballplayer once you realize what your key assets are and what they're going to allow you to do,” he said. Not coincidentally, Gibson ended 2011 with his strongest stretch at the plate since he made the jump to full-season ball two years ago. Gibson hit .274 (59-for-215) after July 1, a period during which he said a season of work with Salem hitting coach Alex Ochoa (who will coach first base for Boston this season) began to pay off. Bruce Crabbe, who managed Gibson in Salem last year, said his second half was “much better” than the first. Going forward, he thinks that sustaining the highs and working through the low points is going to be key to Gibson’s development. Such highs and lows have come to define Gibson’s career so far. After Boston selected him with the 77th overall pick in the 2008 MLB Draft, Gibson signed quickly and spent a month in the Gulf Coast League. He hit .309 in 27 games that summer in Fort Myers, and finished the 2008 season with 14 games in Lowell. The following year, Gibson stayed back in extended spring training and broke camp with Lowell, where he hit .290 with 28 stolen bases in 67 games. He moved up to the 15th spot on the SoxProspects.com rankings chart prior to the 2010 season, but in full-season ball, Gibson struggled. He hit .230 with a .621 OPS with Greenville in 2010, though he swiped 39 bases in 122 games. And despite the late-season success, Gibson still finished with a .240 batting average last season in Salem. He admittedly has been a work in progress at the plate, but entering his fifth season in professional baseball, said he’s learned to take positives from everything. To that end, Gibson is pleased with his performance so far this spring. Gibson was told he was competing for a spot in Double-A Portland this spring, but said he would still be happy with a return trip to Salem. Crabbe said the organization is staying the course with their highest remaining draft pick from 2008.